Km 183 Uruguay River, right margin. Concepción del Uruguay, a city in the province of Entre Ríos, has a population of 72.000 and is located in a farming region with citrus production and poultry-breeding activity. Forestry is also important in the area (eucalyptus). It is connected by the Mesopotámico railway to Buenos Aires and the rest of Mesopotami. Located just 35 km from the Colón-Paysandú bridge and 100 km from the Gualeguaychú-Fray Bentos bridge (both over the Uruguay River) the town has good road connections with all regions. There is an airport with commercial services to Buenos Aires and Paraná on small aircraft. 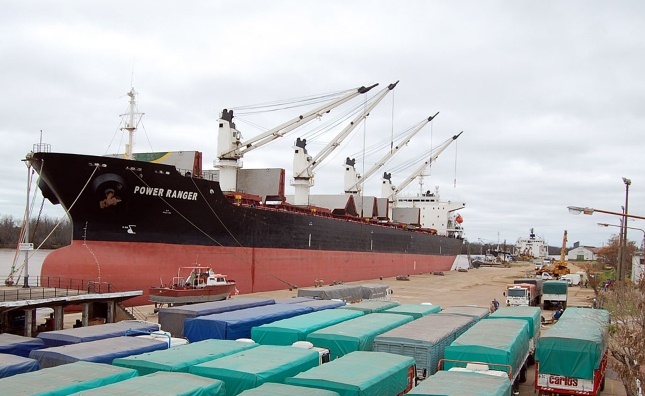 The port of Concepción del Uruguay is situated on the right bank of the Itapé Creek and joined to the river Uruguay by an exterior channel 1300 m long continued by an artificial access channel 1200 m long , both 60 m wide and dredged to 6,70 m (22´); in 2010, reported a minimum depth of 5,70 m at access channel. 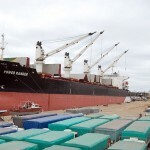 It is about 320 km by road or river from the port of Buenos Aires. The quay frontage extends for 1170 m and consists of a series of quays and jetties numbered 3 to 23. There are, however, only 5 berths in general use. On River Uruguay, right margin, between kms 187,5 and 189,4. Since outbound vessels usually swing to head downriver in this stretch, inbound vessels can anchor at kms 176/77 in order not to interfere with outbound ship´s maneuvers. 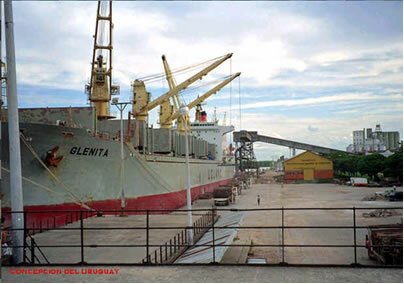 Linking the Uruguay river with the Itapé creek on which the port stands, the exterior access channel is 1300 m long continued by the artificial access canal 1200 m long and both are 60 m wide. Channel depth is 6,00 m (20 ft) at datum; as said, in 2010 reported a minimum depth of 5,70 m at access channel. At end of Access Canal and in the Itape creek offering a turning circle of about 330 m diameter. These are subject to periodic rise and fall of the river, prevailing wind conditions in the River Plate and also on the regulation of the flow of the upriver Salto Grande dam. Generally the river is highest between April/June and September/October and lowest from December to February. 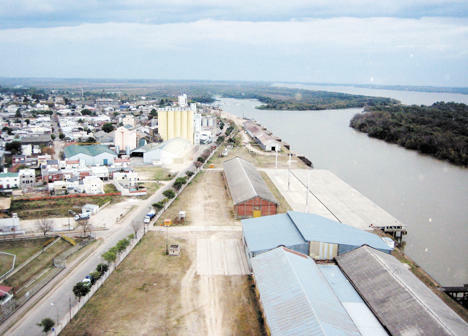 In recent years, minimum river levels below Concepción del Uruguay have been maintained at 5,40-5,70 m (17-19 ft). Max LOA permitted 225 m. Drafts are governed by depths in river passes, with UKC of two feet being required at all times. Governing depths are usually to be found at Paso Punta Amarilla (km 47,8), Paso Abrigo (km 108) and Altos y Bajos (km 175). At km 101,5 the river is spanned by a bridge joining Puerto Unzué (Arg.) to Fray Bentos (Urg.) which at its center has a reported height of 45,25 m at datum. Entry and departure from Concepción del Uruguay are habitually in daylight hours, particularly for vessels of LOA exceeding 140 m. Vessels of LOA over 200 m are not permitted to proceed to the elevator berth if a tanker of LOA exceeding 80 m is berthed at º 5 berth. However, local PNA (Coastguard) have, depending on circumstances, granted exemptions to this regulation. VHF Coastguard (PNA) Concepción del Uruguay L8T Ch # 09-12-14-16. In all cases of vessels entering inwards, except those proceeding directly from a Uruguayan port, river pilots must be requested from the only private company at Buenos Aires whose members are qualified Uruguay river pilots. In any case the port pilot must always be requested from the above mentioned company. 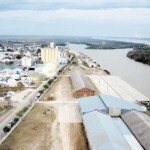 On sailing, the port pilot will also attend as far as Zona Común or, if the vessel is due to proceed via the Paraná river, as far as Nueva Palmira roads where Paraná pilots take over. In the latter case, agents must make arrangements to both send and return the pilots involved to/from Nueva Palmira, usually by river craft to/from Colonia and then by car to/from Nueva Palmira. Municipal hospital and 2 private Clinics. Mobile emergency service available. One 3 star hotel plus various modest accommodation hotels. Through the motorways (provincial/national), interurban and inter-city bus services are provided, likewise to neighboring Uruguay via Gualeguaychú and Colón. Regular daily flights (Monday to Friday) have been established between Buenos Aires and Concepción del Uruguay. Available. Ample preadvise required to arrange necessary documentation. Usually via tank trucks. Available 220/380 V AC up to about 100 KW. Limited pre-loading fumigation can be arranged locally. 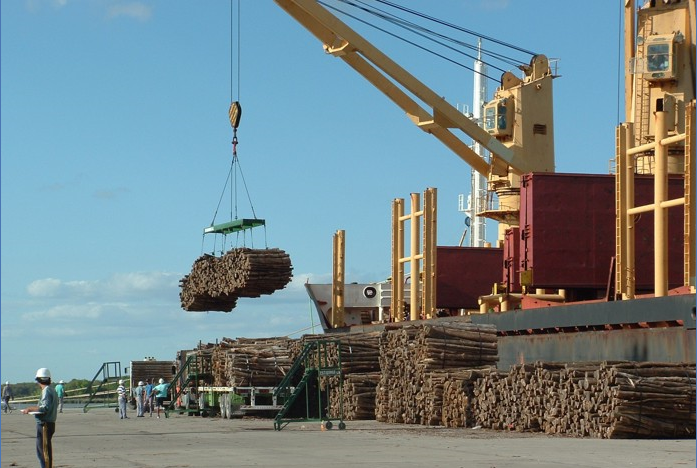 However if fumigation on completion of loading required then specialized firms from Buenos Aires should be called in. Compulsory for foreign flag ships of over 2000 GRT. Mobile cranes 1×175 ton (Liebhere), 2x SWL 7¥25 ton, 3 F/L trucks SWL 6t, 1 tractor. 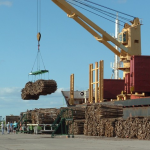 Additional stevedoring equipment available for hire from private firms. 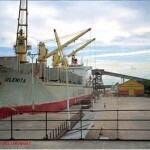 7 bonded warehouses, total 20.000 sqm covered area. Minor repairs can be arranged locally. For electronic equipment, arrangements must be made via Buenos Aires. Grain from elevator	10.000 ton per day.